Have you ever wondered what happens to the trash that is thrown away? Find out by taking a tour of the Tajiguas Landfill. Tours are primarily scheduled on Mondays and Wednesdays and are offered for free to groups or organizations of five or more. The age minimum for this tour is 7 years old. Please note: Due to construction, we are temporarily unable to provide landfill tours. As an alternative, you can request a tour of the South Coast Recycling and Transfer Station. If you live in the southern part of Santa Barbara County, your trash goes to the Tajiguas Landfill (Landfill). 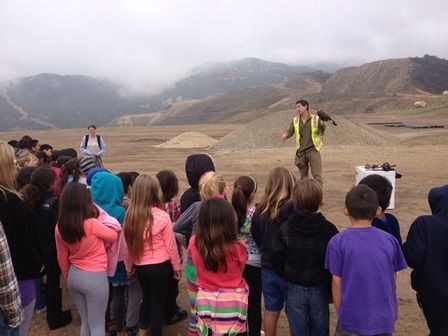 If your group or organization would like to schedule a tour to learn about how the trash is handled and other activities at the Landfill, please contact Sam Dickinson at (805) 882-3618 or send him an e-mail. Sam can schedule tours on most Mondays and Wednesdays. The best time to tour is from 10:00 to 11:30 a.m.
What are some things that I can learn during a tour? If you’d like to spread the word about the availability of free tours of the Tajiguas Landfill, click here to access our flyer. And if you’d like to tour our South Coast Recycling and Transfer Station, check out more information on the Transfer Station’s Tour page. Sam will tailor the tour to the interests and needs of your group or organization. He can provide information on such topics as the Landfill’s history, waste diversion efforts, and actions being taken to protect the environment. Tours can be scheduled on most Mondays and Wednesdays, ideally from 10:00 to 11:30 a.m. For more information, please contact Sam at (805) 882-3618 or send him an e-mail.